Kick off your visit on the 1st (Wed): kick back and relax at Chowpatty Beach and then take a memorable drive along Marine Drive. 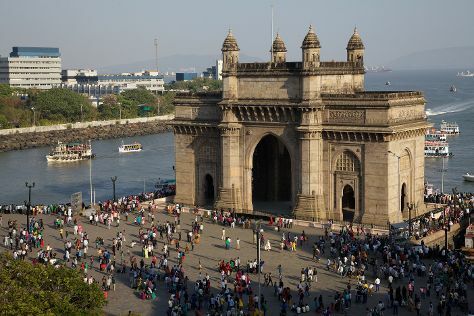 Get ready for a full day of sightseeing on the next day: take an in-depth tour of Chhatrapati Shivaji Maharaj Vastu Sangrahalaya, then don't miss a visit to Gateway of India, then learn more about the world around you at Rbi Coin Museum Mumbai, and finally snap pictures at Bandra-Worli Sea Link. For other places to visit, traveler tips, more things to do, and other tourist information, refer to the Mumbai road trip app . Bhuj to Mumbai is an approximately 3.5-hour flight. You can also drive; or take a train. When traveling from Bhuj in May, plan for a bit cooler days and about the same nights in Mumbai: temperatures range from 39°C by day to 31°C at night. Wrap up your sightseeing on the 2nd (Thu) to allow time to drive to Mahabaleshwar. Start off your visit on the 3rd (Fri): contemplate the long history of Mahabaleshwar Hill Station, don't miss a visit to Kate's Point, then contemplate the long history of Mahabaleshwar Temple, then get great views at Arthur's Seat, and finally explore the activities along Venna Lake. To find ratings, photos, and other tourist information, use the Mahabaleshwar trip planner . Traveling by car from Mumbai to Mahabaleshwar takes 3.5 hours. Alternatively, you can do a combination of flight and taxi; or do a combination of train and taxi. On the 4th (Sat), wrap the sightseeing up by early afternoon so you can travel back home.